Swedish Royal Clothing ID's: Wedding Day!! Well we finally can call her Princess Sofia! Sofia and Carl Philip were married yesterday in a fantastic ceremony full of surprises and little twists that made is personal while also being a state occasion. I loved every minute of it! Let's start our review off with the bride as it only seems fitting! The royal court described Sofia's dress as the following. "The bride's wedding dress, in three shades of white, was created by the Swedish designer Ida Sjöstedt. The dress is made from silk crepe overlaid with Italian silk organza. Couture lace made by José María Ruiz was applied to the dress and the train was hand-cut and then hand-stitched in Ida Sjöstedt's atelier in Stockholm." Her veil had the same detailing. As a wedding gift from the King and Queen she received a new tiara which featured diamond palmette motifs and what looked to be emeralds upon the top. I think it is a beautiful tiara and while I am ashamed that she did not wear the Connaught Tiara (which made an appearance don't worry) I guess I should be happy that she has a tiara of her own as her sisters-in-law already do. For her earrings she looked to be wearing Queen Josefina's Stomacher Earrings which were small enough not to over shine the dress and tiara but they carried the right amount of sparkle! Since I already mentioned the Connaught Tiara, I guess next we should look at Crown Princess Victoria's wedding outfit. Victoria surprised us and wore a custom H&M dress. Who would have thought we would see H&M at a royal wedding! (Actually I saw another H&M gown as well so I guess anything is possible) Apparently Victoria saw this skirt from the H&M Conscious Collection and had her stylist contact them to see if they could make it into a dress for her. She looked stunning and I think she made an excellent choice. For jewels Victoria gave us a real treat by wearing the Connaught Tiara for the first time ever. I love how simple yet stunning this tiara is. Victoria has worn it as a necklace once before but never as a tiara so I was extremely excited to see her in it at the wedding. (Even if it meant that Sofia would not be wearing it) Victoria wore pearl earrings from the Bernadotte Collection and a diamond bow brooch with a pearl drop (both which we have seen Victoria wear before). 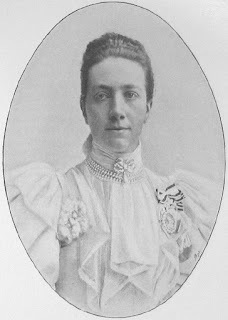 The brooch can be traced all the way back to Victoria of Baden. Her pin on her back was a small diamond brooch but I am unsure if it is one of the diamond buttons or her brooch from Lilian and Bertil. "Victoria, Svenskt porträttgalleri". Licensed under Public Domain via Wikimedia Commons. Estelle was also there acting as a bridesmaid, something that was very much expected. She wore a dress from Ida Sjöstedt and a bow and shoes from Livly. She carried a miniature bouquet of flowers matching Sofia's. Estelle had some fantastic moments which I am sure we will look at shortly as the schedules are looking bear for the Swedish Royal Family in the next week or two. (Which is quite understandable with the big affair they just put on). Moving on to Madeleine- She wore a gown from Elie Saab's Resort 2015 Collection which she had modified to fit her 9 month adorable baby bump. She was glowing. She carried a clutch which is also from Elie Saab and I saw that she went with lower heels than she is normally used to, something I was very pleased to see! Madeleine gave us flashbacks to her wedding with the jewels. She wore her wedding tiara, the Carl XVI Gustaf Modern Fringe, which is suspected to have been a gift from the King to the Queen on their 10th Wedding Anniversary. It is Madeleine's favorite tiara to wear and she probably choose it for that reason as well as it's lightness in weight. She paired it with the Vasa earrings and a bracelet I had never seen before. She wore the diamond bow brooch and on her back was one of the diamond buttons. Leonore turned up in all her adorableness and fidgetyness! She looked adorable wearing a dress which was once worn by King Gustaf VI Adolf (the dress is over a hundred years old). She was extremely intrigued by everything from the tiaras to the ceiling to Queen Margrethe! She was passed down the line of aunt, uncle, grandmother a few times and at one point some of us were joking that Sofia was going to end up holding her! Finally Queen Silvia- She turned up in a dress that just screamed typical Silvia. Nothing too spectacular or surprising but I was pretty close with my color prediction of purple. Her dress had a purple hint to it- or at least in my eyes it did. As for jewels I was correct in my prediction of the Leuchtenburg Sapphires being brought out. While this is one of Silvia's "big guns" it is actually quite lightweight making it easy to carry on your head for an extended period of time. (Which the wedding celebration was- Silvia and Carl Gustaf did not leave until around 4am!) On her back Silvia had a diamond brooch which I suspect to be one of the diamond buttons. Over all it was a fabulous wedding and my jewel predictions were 50% correct. Victoria surprised me by not wearing any of Lilian's jewels but I was glad to see her in the Connaught! Later in the week I will post about the King's sisters apparel and jewels. A fabulous summary post - you've worked fast to get that up after a long day yesterday! Well done. I agree that Silvia's dress is of the purple palette. I think it will be all quiet except for Madeleine & Chris' new arrival - I think it will be a boy given how she's carrying this time - must be any day now! Your knowledge on the family is formidable - thank you for sharing all the info.! do you know anything about the braclet madeleine woere at the weeding? I do not know anything about this bracelet but I am trying to figure out if we have seen it before. I shall keep you updated!